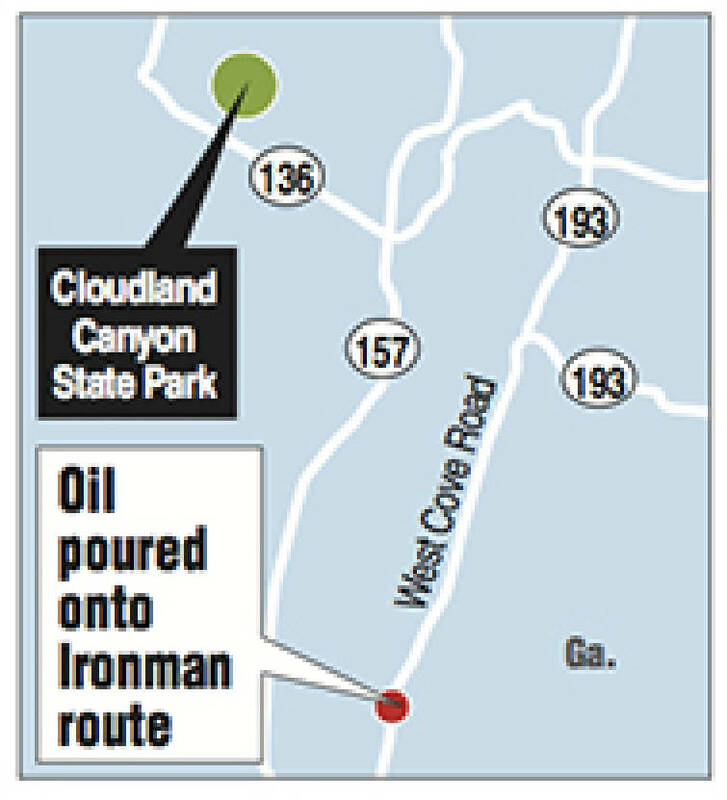 Oil and tacks were thrown onto Walker County, Ga., roads during the Ironman Triathlon over the weekend. Site of attempted Ironman Chattanooga sabotage. Ironman cyclists approaching the 30-mile mark on Sunday's grueling 116 mile bike course did not expect to hear the Walker County sheriff frantically yelling at them to "ride left!" Sheriff Steve Wilson and several other officers personally directed each cyclist around gallons of shiny silver oil dumped in the riders' path on narrow, two-lane West Cove Road in Chickamauga, Ga.
Maj. Mike Freeman said the oil "was strategically placed in a dip in the road" and "as slippery as walking on ice." Motorists driving through the dip spread the oil about 200 yards down the road. Calls started coming into dispatch about 7:30 a.m., with some drivers saying the slick had nearly caused them to crash. But that early alert allowed the sheriff's office rapidly to respond and protect the Ironman competitors. Freeman said not a single cyclist lost so much as a second because of the malicious prank. Tacks also were scattered at various points on the bike course, causing numerous flats. The department believes locals were behind the sabotage and officers said they are taking the investigation very seriously. Chattanooga Mayor Andy Berke acknowledged the incidents were upsetting but said they should not overshadow the enthusiasm and support from everyone who cheered for the Ironman on Sunday. "People are celebrating our status as a premiere outdoor city," Berke said. "Over the last couple days I have heard again and again how excited people were to be at that event." Vicki Cox, a local cyclist, said, "I'm just embarrassed there are these people who spend their lives getting ready for these things, and then some stupid person who didn't have a clue ruined it for them." Staff writer Hannah Smith contributed to this report.